My thoughts on the latest EP from You’ll Melt More! It feels like You’ll Melt More! have been pretty active with the new music releases this year, which I guess makes sense when you consider 2017 is the group’s 5 year anniversary. That’s a pretty big milestone for any Idol group, as many don’t tend to stick around that long. The party isn’t over yet either because in addition to this EP, they also have a brand new album slated for release on November 29th as well as a whole heap of tour dates all across Japan. You’ll Melt More! sure do know how to throw a party that’s for sure. 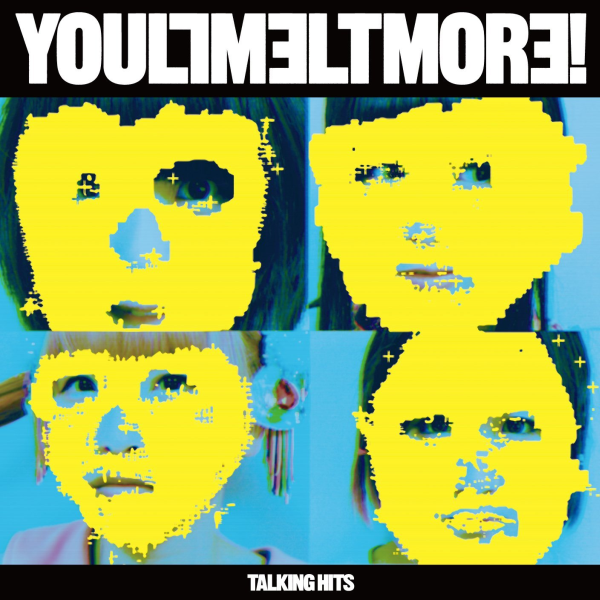 Just to get this out of the way, but yes that cover they’re using is indeed a homage/rip-off/etc of the classic Talking Heads album “Remain In Light”. I guess this is You’ll Melt More’s new thing, until they get sued by someone anyway. You gotta wonder what the cover of the album is going to be based on seeing as we’ve already had Primal Scream and now Talking Heads. Guesses on a postcard to my fictional PO Box. I’m thinking maybe something from The Cure or The Smiths myself. Or who knows, maybe it’ll be something completely unrelated. Also of note is that the members have apparently written the lyrics for all of the songs, so that’ll be interesting to hear. Getting back to this EP though, all I’m really wondering coming in is which You’ll Melt More! is going to show up. If it’s the You’ll Melt More! that did “WE ARE A ROCK FESTIVAL” (review here) or “Disco Psychedelica” (review here) then I’m going to be a pretty happy camper. On the other hand, if it’s the You’ll Melt More! that did “Kodoku to Gyakushu” (review here) then I’m probably going to be pretty underwhelmed. I’m also mindful that there’s an album coming in the not too distant future so the chance of these being rejected album songs is non-zero. Let’s cut the negativity though and actually get into the review. Kicking things off is “NEW WAVE STAR”, which as a side note wasn’t initially available with the digital release of this CD for some reason. Now, with a title like that it makes me think this is going to be a New Wave style song. That turned out to be a pretty good assumption, because the instrumental very clearly draws a lot of inspiration from New Wave songs of the 80s. Repetitive, steady guitar strumming, lots of hi-hat abuse coupled with rhythmical vocal delivery makes for quite the throwback. It’s not exactly something I go out of my way to listen to, but I don’t mind New Wave and I also don’t mind “NEW WAVE STAR” either. “A! Sekai wa Hiroi Sugoi” follows, with the title basically meaning “Ah! The World is Wide and Amazing”. A pretty accurate statement, as long as you’re not bitter and jaded anyway. Unfortunately, I wouldn’t go as far as to apply the word “amazing” to this song. It’s one of those meandering ballad type deals with an admittedly fairly interesting instrumental at times. There’s a lot of synthesizer in play, some sparkles but also a good deal of guitar and drums. Vocally it’s okay but it’s not going to knock anyone dead, kinda feels like we’ve heard this kind of song from You’ll Melt More! before is the overall feeling I take away from this one. Last up is “Eien no Shunkan” or “Eternal Moment”. Well, if “A! Sekai wa Hiroi Sugoi” was ticking boxes for you then this song should also be pretty enjoyable. There’s not really any guitar or drums this time around but the sparkly synths make another appearance. An interesting decision to include two rather similar songs back to back. However, “Eien no Shunkan” is of course a little different. Vocally I think it’s a much cleaner and more impressive performance and I thought the small talking and rap segments broke it up nicely. It also built up a bit of steam towards the end so it’s not like it was totally flat. I was actually kinda reminded of Zenbu Kimi no Sei da when listening to this one. Well, in the end I guess this release kinda went how I thought it might. There’s nothing really bad to say about it, but at the same time I’m not exactly rushing out to tell people how great it is either. “NEW WAVE STAR” is an interesting song but the decision not to include it in the initial digital release of this EP still perplexes me to this day. “Eien no Shunkan” is worth a listen if you’re a Zenkimi fan and “A! Sekai wa Hiroi Sugoi” is just kinda there. That’s just my opinion though. Hopefully this release being a bit lackluster means You’ll Melt More! are saving the more choice cuts for this album that’s coming out real soon. Considering most of their music in the past year or so has been on mini-albums, it’ll be interesting to see what’s included there. Guess we’ll find out soon enough.